With its raceway flag design, the embroidered logo Raceway Cap will leave you in first place. Is your business related to car or motorcycle racing? 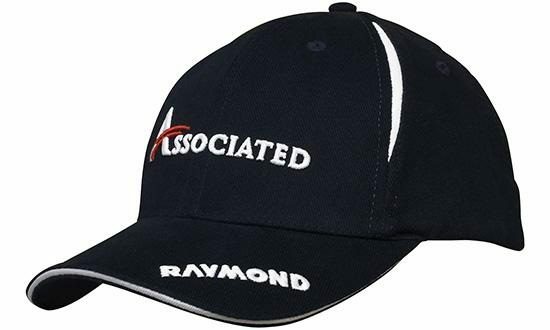 The custom printed Raceway Cap is a great promotional product that will delight your avid customers. 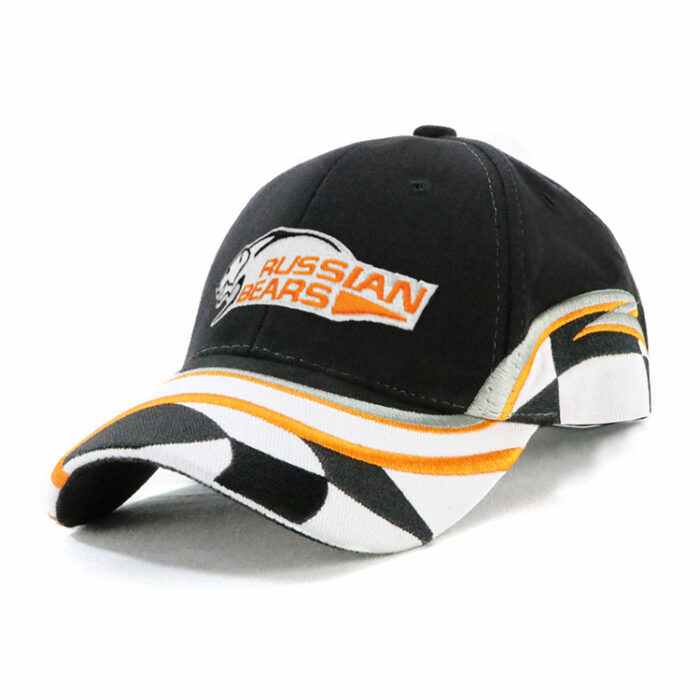 It features a chequered racing flag on its brim which extends a little to the bottom right of the cap’s crown creating a striking design. This design gives the best prop to your company logo when you have your logo added to the front panel. 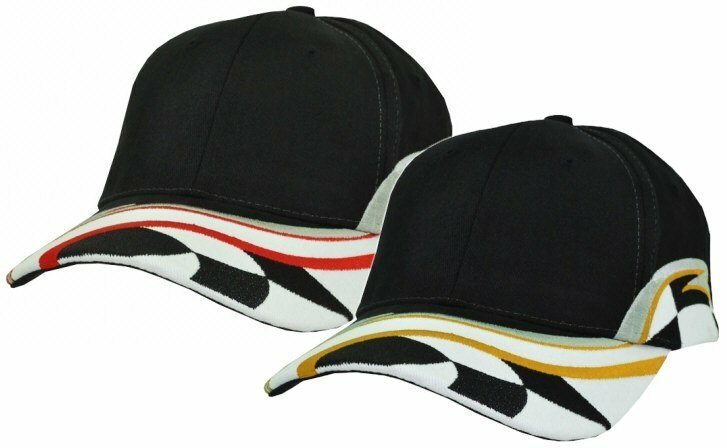 Take a look at two more promotional caps from our product line with racing designs – the Racing Stripe Cap and the Baseball Cap with Checks. 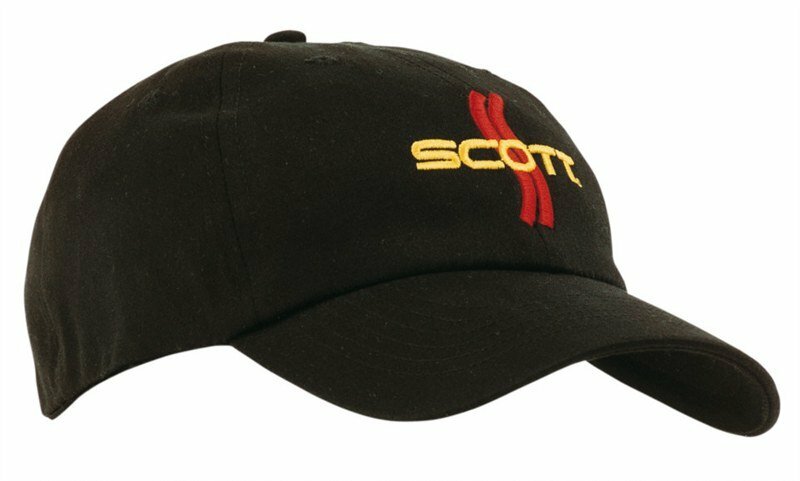 The Raceway Cap is made of heavy brushed cotton fabric and has a Velcro cross-over strap. It is available in two color combinations: black/grey/red and black/grey/orange. 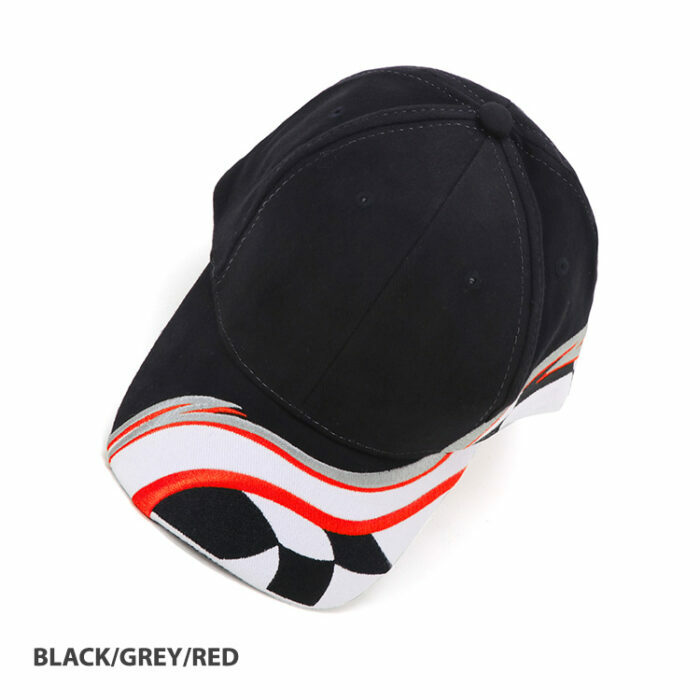 The cap has a black crown with a black and white chequered racing flag. You can then choose to go with either a grey/red accent or grey/orange accent. The use of the chequered flag as a signal during races is known to date as far back as the 19th century but the first known photographic evidence of its use in the auto racing industry was in 1906. The black and white chequered flag was waved to signal the end of the Vanderbilt Cup race held in 1906 in New York. The Vanderbilt Cup was the first international auto racing event featuring major trophies held in America. Although auto racing was already greatly followed in Europe by the 1900s, it was not yet established in America until 1904 when the Vanderbilt Cup was founded. To provide the best advertising view for your company, have your logo embroidered or printed on the front panel of this corporate cap. Your logo will be accentuated by the chequered racing flag on the cap’s bill. Watching racing events is more enjoyable when it’s a family affair. Why not check out our personalised caps for kids that you can include with your promotional campaign? 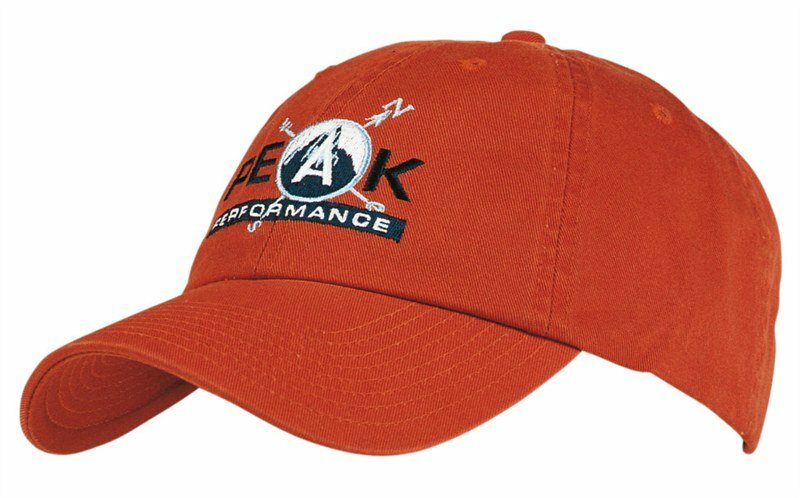 Give your brand the best starting position with our customizable Raceway Cap. Its sporty design is sure to make your advertising a winner. Reward a good run with our Lindor Balls 4 Pack Cello Bag! Try too our other promotional sweet and savory confectioneries. We’re looking forward to hearing from you. Call us at 1300 008 300 now!